As an application of the Poisson approximation to Binomial, we consider the Birthday problem, which is quite interesting. Do you know whether there are two students in your class having the same birthday? (This question is different from is there any student in your class who has the same birthday as you.) 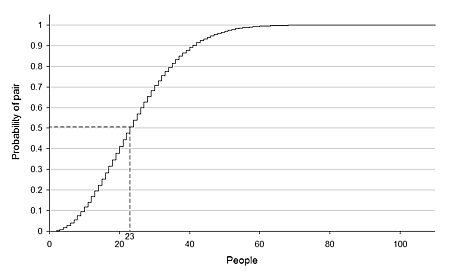 The answer in probability is quite surprising: in a group of at least 23 randomly chosen people, the probability that some pair of them having the same birthday is more than 50%. For 57 or more people, the probability reaches more than 99%. And of course, the probability reaches 100% if there are 367 or more people. 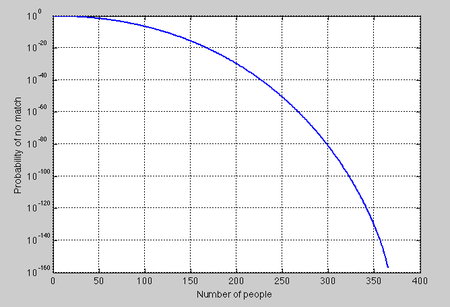 Below is a graph showing the probability against size of the group. The event that at least one pair has the same birthday is complementary to the event that all n birthdays are different. Therefore p(n) is equal to 1 minus the above probability. You can plug in n=23 and n=57 to the above formula to check if the previous statement is correct. What about the assumption that birthdays are uniformly distributed? In reality, birthdays are not uniformly distributed. The answer is that the probability of a match onlly becomes larger for any deviation from the uniform distribution. This result can be proved rigorously but involves more mathematics. Intuitively, you might better understand the result by thinking of a group of people coming from a planet on which people are always born on the same day! Then actually 100% any pair is a match, of course, this is the greatest deviation from the uniform distribution I can think of.